This special focus issue contains all new material, structured like every other issue, but centered on one theme - programming for the winter holiday season. You'll find everything you have come to expect from Recorder Classroom including our great team of writers working with all types of holiday music. On Christmas Night - a spectacular opener from Paul Jennings, with optional parts for two sopranos and alto recorder set against a rich orchestration for full orchestra. We wanted to make sure that we had a bit of tasty jazz, so we have the kids doing some singing and playing with Paul and Teresa's new Gingerbread Jazz. A Nutcracker Mini-Suite from Dan Thieman which includes the "March," "Arabian Dance," and "Waltz Of The Flowers." It, too, is recorded with full orchestra and features two soprano parts, with the optional second part designed for players with very limited technical abilities. A beautiful rendition of In The Bleak Midwinter strikingly arranged and orchestrated by Mike Wilson. Red Suede Shoes by Teresa Jennings adds a jingle and much fun to a bit of Elvistine rock for your young players with tracks that make it a guaranteed favorite. From Karl Hitzemann comes a touching setting of the beautiful old carol Gesu Bambino and a spirited arrangement of the Hanukkah classic, I Have A Little Dreidel. A unique "pickin' and grinnin'" setting of I Saw Three Ships, recorded with tongue-in-cheek by John Riggio. The Virtual Consort work for this issue is Paul's very playable Jinglebotz, set for SSATB recorders with optional percussion parts. As with all of our Virtual Consort selections, there are many options. You can play it with just your players or with the fun-loving tracks. And if you don't have a full consort, we have several different tracks that provide some of the lower parts of the ensemble as a part of the recorded tracks. Zippy Toad makes a spectacular return with an orchestrally disco-flavored O Toadenboing. For a gentle reprieve, Teresa composed a distinctively evocative new duet, Floating Like A Snowflake, that is fun for each part, and which comes with tracks that feature acoustic guitar and mandolin. Also look for a new article from Artie Almeida in her "Fun Foundations For Recorder" series, which features several holiday-themed activities, including the very special Nutcracker Walkabout that will have your students asking for it again and again. She also has a nice lesson that uses six arrangements of "I Have A Little Dreidel" to study style and articulation. And don't miss Norm Sands' holiday contribution to this issue, Wintertime Torch Song. It's one his fans won't want to miss! Many of the songs are arranged with at least two interchangeable soprano recorder parts: one easy, and one harder. Some bigger settings also include optional alto recorder parts with technical demands appropriate to players just getting to know the instrument. This jam-packed issue also has a number of valuable web-based resources. Recorder Classroom: Focus On The Holidays - Download Special Issue - Mag with Audio FilesAccess downloads at RecorderClassroom.com. An account is created for you after you purchase this issue: Read your e-mail carefully. 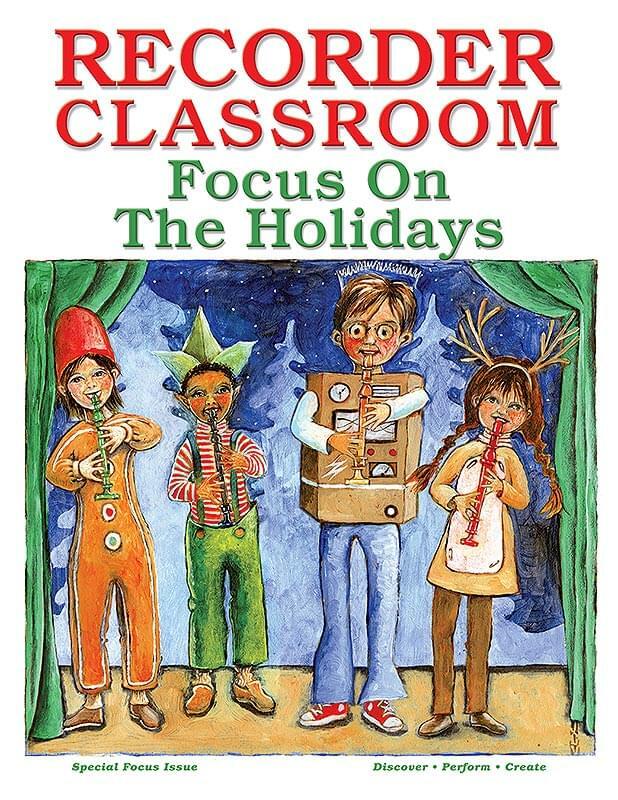 Recorder Classroom: Focus On The Holidays - Print & Download Special Issue w/CD & Audio FilesAccess downloads at RecorderClassroom.com. An account is created for you after you purchase this issue: Read your e-mail carefully.